A 20-year-old male, resident of Jharkhand, presented with the complaints of (informant about childhood history: Father, reliable). Bluish discoloration of fingers, toes, and lips: Since early childhood. The patient was apparently well till early childhood, when he developed insidious onset breathlessness on exertion. He used to get short of breath on climbing two to three flights of stairs (New York Heart Association-II [NYHA-II]). The breathlessness remained constant till 6 months back, since when it has gradually progressed to NYHA III. There was no history of orthopnea or paroxysmal nocturnal dyspnea. The patient also developed palpitations in early childhood, which had a gradual onset on exertion and were relieved with rest. The heart beat was regular, without any history of skipped beats or abnormal rhythm, dizziness, or loss of consciousness. The patient's father noticed that the boy had bluish discoloration of the fingers, toes, and lips, when he was 2-year-old. There was no history of sudden worsening of symptoms or spells or history of squatting. There was no history of cough or pedal edema. There were no hyperviscosity symptoms or bleeding. There was no history of recurrent respiratory infections in infancy, sweating during feeds, or turning blue during feeds. There was no history suggestive of poor weight gain during childhood. There was no past history of hospitalization or any significant childhood infections. He was born of a full-term vaginal delivery assisted by a dai. There were no maternal peripartum complications. There was no family history of similar illness or consanguinity. The patient worked in a restaurant as a cook and had previously studied up till Class VI. There was no history of frequent absence from school or work due to illness. This is a 20-year-old patient who was cyanosed since 2 years of age with shortness of breath which was Class II and has now increased without any history of squatting/spells and no history of recurrent lower respiratory infections. Central cyanosis starting at 2 years and patient well preserved till 20 years of age. Central cyanosis causes can be broadly classified into pulmonary (upper and lower airway), cardiac, vascular, and defective oxygen transport due to hemoglobin (Hb) with low affinity to oxygen or excess Hb. Since there is associated progressive dyspnea on exertion, it favors a cardiovascular cause. Palpitations do not appear to be arrhythmic as there is a regular onset and offset and there are no skipped beats. Central cyanosis in adults can be due to defective Hb, respiratory, or cardiovascular causes [Table 1]. Cardiovascular - Cyanotic congenital heart disease, pulmonary arteriovenous (AV) fistula. 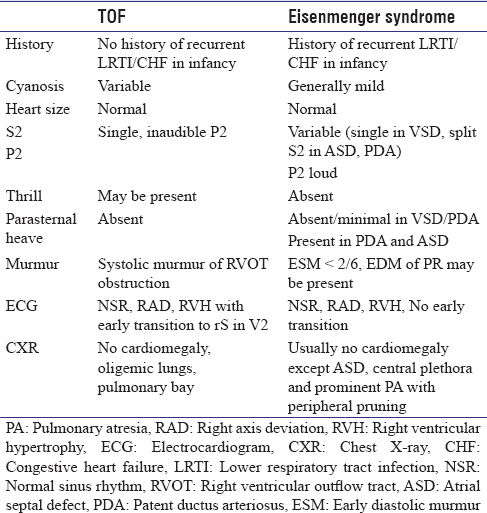 Differentials to be considered for an adult patient presenting with cyanosis are mainly tetralogy of fallot (TOF) physiology versus Eisenmenger syndrome apart from Ebstein's anomaly [Table 1], [Table 2], [Table 3], [Table 4]. There was no history suggestive of cyanotic spells till now. There was no history of recurrent respiratory tract infections. Since the cyanosis appeared at around 2 years of age, it makes single ventricle with pulmonary stenosis (PS)/transposition of the great arteries (TGA)/ventricular septal defect (VSD) with PS unlikely. Absence of history suggestive of increased pulmonary blood flow such as recurrent respiratory tract infections and congestive heart failure (CHF) in infancy makes Eisenmenger syndrome unlikely. Moreover, the cyanosis onset is usually not so early in Eisenmenger. Possible differentials are as follows [Table 1]. 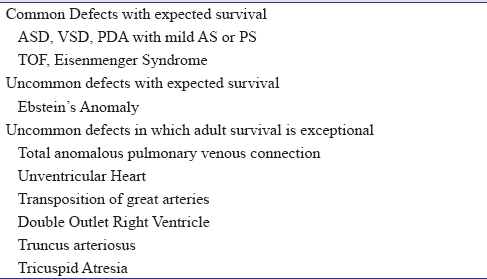 Very less likely possibility: Eisenmenger syndrome [Table 2]. On examination, the patient was conscious, cooperative, and well oriented to time, place, and person. He was comfortable at rest. Body mass index was 18.2 kg/m 2. The pulse rate was 60/min, regular rhythm, normal in volume. There was no abnormal character to the pulse. All peripheral pulses were palpable and symmetrical with no radio femoral delay. The blood pressure in the right arm sitting position was 140/85 mmHg. The respiratory rate was 16/min. The digits of all four limbs and the lips were equally cyanosed and a saturation of 76%. There was Grade III clubbing of the fingers and the toes. The lower palpebral conjunctiva appeared plethoric. The jugular venous pressure (JVP) was elevated, 5 cm above the sternal angle in semi-recumbent position. On cardiovascular examination, the apex beat was in the 5th intercostal space (ICS) near the mid clavicular line right ventricle (RV) type of apex. There was no parasternal heave. A systolic thrill was palpable in the third and fourth left ICS along the sternal border. On auscultation, the S1 was normal and the S2 was single and loud. An ejection systolic murmur was heard, loudest along the left sternal border in the 3rd and 4th ICS, Grade IV in intensity and radiating to the back. The chest examination was normal, and the liver was not palpable. Can you highlight the salient positive or negative features in the examination which will aid in your diagnosis? VSD with PS physiology is the most likely diagnosis in a cyanotic adult patient with the above findings. Usually, systolic thrill in TOF indicates good pulmonary blood flow as sufficient flow is needed for thrill. A good pulmonary blood flow is not associated with cyanosis. Presence of systolic thrill along with single S2 favors DORV/VSD and PS. There is significant cyanosis with systolic thrill. This is mostly due to streaming of blood into aorta in DORV. Presence of systolic murmur and absence of continuous murmurs rules out TOF with pulmonary atresia. Presence of RV type of apex and the development of delayed cyanosis after 1 year makes it unlikely. Development of delayed cyanosis and longevity till this age makes it less likely. Presence of RV type of apex and delayed cyanosis essentially rules out the diagnosis. The onset of cyanosis at 2 years of age and no history of recurrent chest infections rules out Eisenmenger syndrome. There is no evidence of pulmonary hypertension on clinical examination, which further helps in the exclusion [Table 2]. Absence of cardiomegaly and presence of single S2 without any split S1 essentially rules out Ebstein anomaly. A thrill in the pulmonary area is almost never found in Ebstein's anomaly. Electrocardiogram (ECG) reveals normal sinus rhythm with right axis deviation and right ventricular hypertrophy with monophasic R wave in V1 and transition to rS in V2. Clockwise depolarization is evident with q-waves in lead II, III, and aVF. Prominent R waves in V5–V6 indicates well developed left ventricle. Overall ECG is suggestive of Tetrology of Fallot [Figure 1]. 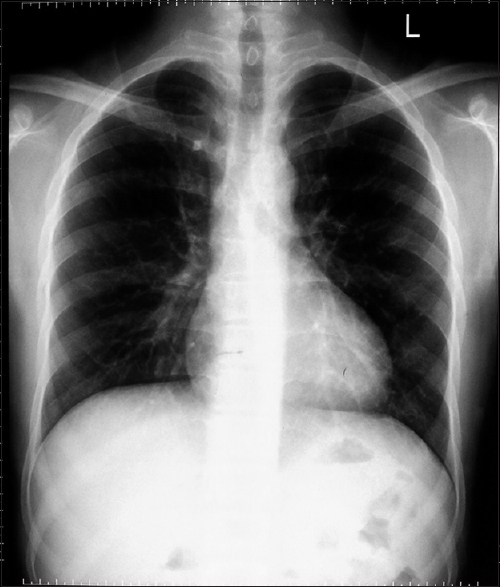 Chest X-ray (CXR) PA view reveals no cardiomegaly with decreased Qp as evidenced by decreased pulmonary markings in the middle third of lung fields. Pulmonary arteries are not prominent. RV type of apex is seen as evidenced by acute angle at the apex [Figure 2]. Situs solitus, levocardia, overriding of aorta <50%, large nonrestrictive subaortic VSD, infundibular PS with bilateral confluent pulmonary arteries [Figure 3]. Figure 3: Echocardiogram showing aorta and Doppler signal across right ventricular outflow tract. Cyanotic congenital heart disease. Reduced pulmonary blood Tetrology of Fallot (Large nonrestrictive subaortic VSD with severe PS), No CHF, NSR, NYHA Class III. Cardiac catheterization followed by corrective surgery. What are the issues with cyanotic heart disease in adults? Coagluation abnormalities include secondary erythrocytosis leading to hyperviscosity syndromes, abnormal hemostasis due to reduced platelet count and function, clotting factor deficiencies. Neurological complications include predominantly brain abscess unlike CVA, which is common before 2 years of age. Other known complications include increased creatinine levels, abnormal urate clearance leading to gout, proteinuria, hypertrophic osteoarthropathy, gallstones, and acne. In adults, ventricular dysfunction, patent ductus arteriosus, aortic regurgitation, or postshunt surgery. Systemic hypertension, anemia, infection, infective endocarditis. A prominent “a” wave is seen in many adults with TOF. Patient with uncorrected tetrology of Fallot living into adulthood tend to have normal or nearly normal pulmonary blood flow. Hence, they are likly to be mildly cyanosed or pink. It should be noted even in pink TOF, the PS is always severe hemodynamically. The RV systolic pressure is always systemic in TOF, and PA pressure is always normal. These patients are usually brought to attention by the conspicuous presence of a systolic murmur. Patients with more severe PS tend to have more cyanosis and exertional dyspnea due to poor tissue oxygen delivery. The patients surviving into adulthood get adapted to the disease with low exertional levels. Adult TOF patients more often have extracardiac shunts in the form of aortopulmonary collaterals. JVP may be elevated in adult TOF. Various issues with regards to surgery in an adult patient with uncorrected TOF include myocardial fibrosis leading to ventricular dysfunction, long-standing cyanosis, and polycythemia responsible for multiorgan dysfunction and a fragile ventricular muscle, leading to an intraoperative bleeding tendency and ventricular arrhythmias. There is increased risk of congestive heart failure secondary to poor LV compliance postsurgery. In addition, adult patients can have concomitant atherosclerotic vascular disease and valvular heart diseases that have to be screened before procedure. Despite the risks involved, surgery signficantly improves the effort tolerance and improves quality of life. How would you differentiate tetralogy of fallot physiology versus Eisenmenger syndrome? How would you differentiate various types of tetralogy of fallot physiology based on electrocardiogram findings? Does tetralogy of fallot always need surgery? Patient with TOF survive upto 66% at the end of 1 year, 49% until 3 years, and 24% until 10 years. The quality of life is also poor and there is increased morbidity and mortality from cyanotic spells. How to investigate and manage this patient? Echocardiography (ECHO) helps in confirming diagnosis, assessment of the anatomy of the pulmonary arteries, coronaries, and the presence of major aortopulmonary collaterals (MAPCAs). In this patient, considering the duration of illness and the severity of cyanosis, possibility of MAPCAs are high, and patient will require further imaging to delineate them. From surgical point of view, apart from the anatomy of the TOF, confluence of the pulmonary arteries, presence of MAPCAs, coronary anatomy is essential to plan the surgery. Cardiac catheterization study can adequately delineate these structures and coil embolization of MAPCAs can be done prior to surgery. Trilogy of fallot is severe PS with intact interventricular septum and ASD. In trilogy, right ventricular pressures can exceed systemic pressure and right heart failure can occur and is the most common cause of death. JVP may be raised with large A-waves in PS with intact ventricular septum (IVS). Length and loudness of murmur is directly proportional to the severity of stenosis unlike TOF and is maximal in the left 2nd ICS. There is the presence of a wide split S2 unlike Single S2 in TOF. Pulmonary ejection clicks are heard in trilogy, whereas it is absent in TOF, where aortic ejection clicks can occur. Cyanosis in trilogy of fallot is mainly influenced by the RV compliance elevated RA pressure which determines the extent of shunt at the atrial level. On cardiac catheterization, right ventricular pressure has a flat or rounded top in TOF and postventricular premature complexe potentiation is <10 mmHg. 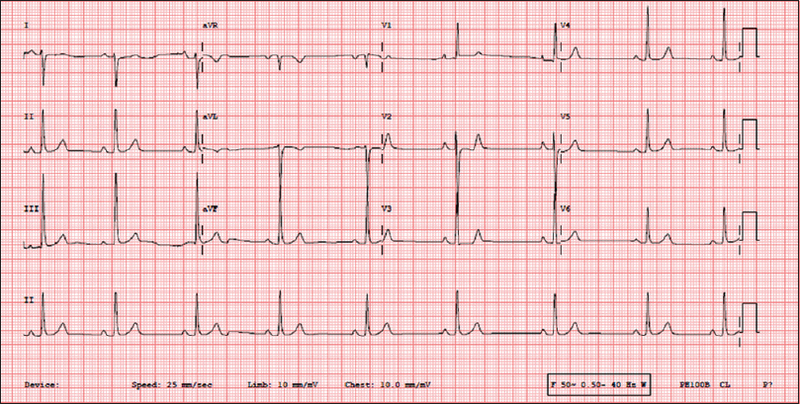 In PS with IVS, the trace is triangular in shape and shows postpremature ventricular contraction potentiation. Right atrial pressure may be elevated in PS with IVS, which is very rare in TOF. ECG reveals right axis deviation with right ventricular hypertrophy with inverted T waves due to suprasystemic pressure, which can extend upto lead V4. CXR reveals dilated pulmonary arteries with oligemic lung fields, and there is cardiomegaly due to dilation of RA and RV. LV is well developed and hence boot shaped heart is not seen. What are the causes of thrill in pulmonary area (both in cyanotic and acyanotic)? PS (usually valvular), TOF (mostly in pink TOF), ASD esp with excess flow like in Lutembacher syndrome, and outlet VSD. What are the causes of heart failure in tetralogy of fallot? Restrictive VSD, ventricular dysfunction, anemia, shunt surgery, hypertension, aortic regurgitation, tricuspid regurgitation, and infective endocarditis. 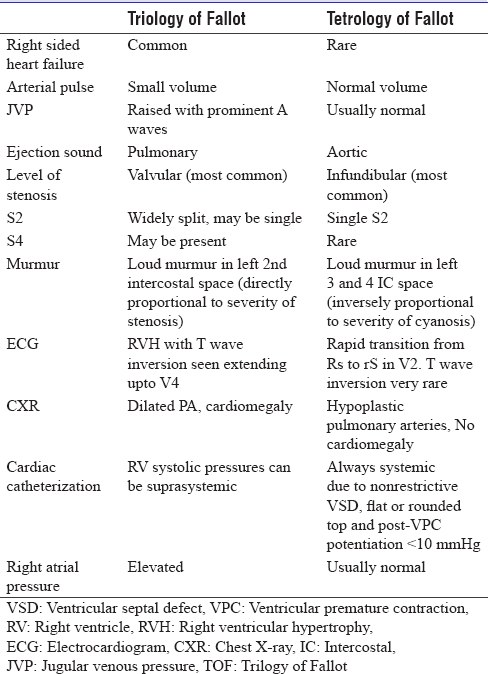 What are the clinical signs that suggest it may not be tetralogy of fallot in a patient with ventricular septal defect/pulmonary stenosis physiology? Absence of murmur in PA – malposed pulmonary artery, pulmonary atresia, poor antegrade flow. This was a patient who presented with cyanosis as an adult. The conditions which can present with cyanosis with onset in childhood and permitting survival into adulthood were discussed. The primary disease which comes to mind is the various kinds of TOF physiology which were discussed. The ECG, CXR, and ECHO were discussed. Certain aspects of an adult patient with TOF have been discussed. Sommer RJ, Hijazi ZM, Rhodes JF. Pathophysiology of congenital heart disease in the adult: part III: Complex congenital heart disease. Circulation 2008;117:1340-50. Hamamoto M, Morifuji K. Surgery for an adult with tetralogy of Fallot and acquired heart disease. Asian Cardiovasc Thorac Ann 2014;22:607-10. Atik FA, Atik E, da Cunha CR, Caneo LF, Assad RS, Jatene MB, et al. Long-term results of correction of tetralogy of Fallot in adulthood. Eur J Cardiothorac Surg 2004;25:250-5.